Do you need an electronic scale for reloading? No, handloaders got along just fine for years before electronic scales, and you can continue with a balance beam scale without reservations..
Should you have an electronic scale? I haven't used my balance beam scale since electronic reloading scales appeared many years ago. There are so many advantages with an electronic scale that I truly believe that every serious handloader should find the money to have one on his bench. I usually weigh every charge when I am reloading any rifle cases. Because many hunting rifle loads use extruded powders and they do not meter through a powder measure with enough precision, I weigh every charge, particularly with near maximum loads. Even with ball powders if the load is near maximum, I weigh every charge. I set the powder measure to throw a charge about a grain under my target weight and use a powder trickler to bring the charge up to my desired weight. With a balance beam scale you must wait for the arm to settle down each time you touch the scale, whereas an electronic scale settles down much more quickly, which makes this chore much faster. This feature is really a blessing when you're weighing bullets or cases. When sorting a lot of these, an electronic scale is many times faster than a mechanical scale. Also, there is a far lesser chance for a mistake with the digital readout of an electronic scale than there is with the additive system used in mechanical balance beam scales. With mechanical scales you must place the poises in specific notches along the balance beam and it's easy to misread and put it in the wrong notch. Then you must use another poise or threaded weight to further adjust the scale and add the two together. With a digital scale you simply read the number on the readout. The possibility for error is greatly reduced. As with any scale, make sure the surface you place it on is dead level. Also shield it from any wind or air currents. While this is obvious when loading outdoors at the range, it can create problems inside as well if you are running a heater, fan or an air conditioner. Always let your electronic scale warm up a little while before using it and follow the instructions for calibrating and check calibration often. RCBS makes a handy check kit of calibration weights that is useful for any scale. In today's world, electronics have made life much easier, and reloading is no exception. Try an electronic scale. I'll bet you'll never even look at your old balance beam scale again. 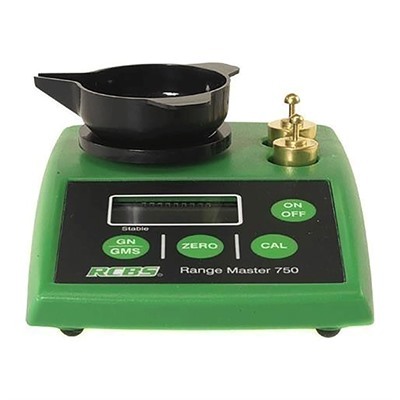 Click to our reloading department of our online store to check out the selection of electronic scales and other reloading equipment available at special member prices.